Designed especially for limestone applications, this new high reach - single boom jumbo is completely self-contained. It is powered with a fuel efficient and environmentally friendly Tier 4 Final diesel engine and equipped with onboard compressor and water-tank for air-mist flushing. With the new Intelligent, state-of-the-art control system it will bring to customers high quality and increased productivity in both tunneling and underground mine production. The DT912D – a self-contained, air-mist flushing, diesel-hydraulic high reach single boom jumbo – offers high quality drilling in its most advanced form. 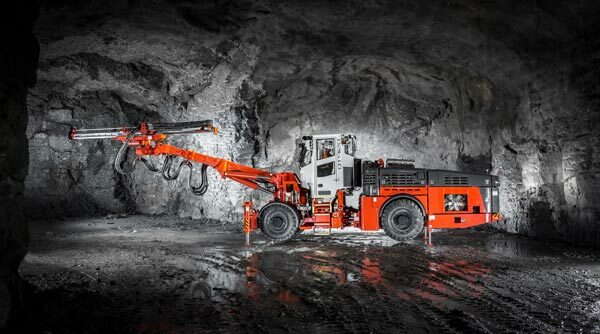 Designed for fast and accurate drifting and production drilling of 12 to 125 m² (130 to 1345 sq-ft) cross sections, the 24-ton jumbo combines Sandvik’s novel technology, creativity and expertise with the vast experience gained over the decades in the business. Being completely self-contained the DT912D is an optimal machine for multifaceted operations that will take excavation efficiency to another level. The DT912D has boosted performance written all over it. Featuring a 25 kW (33.5 Hp) high frequency RD525 rock drill for superior drilling performance with high lifetime, as well as the most powerful engine ever installed on a diesel-hydraulic jumbo, the Cummins Tier 4 Final with 205 kW (275 Hp), the machine can bring a true boost to productivity with low fuel consumption. As a standard, the jumbo has an electric controlled drilling system with added automatic functions, including one-hole automatics and is equipped with a SB150 universal boom for large, optimally shaped coverage and full automatic parallelism. In addition to face drilling, the versatile boom can also be used for crosscutting, bolt-hole drilling and extension drilling. Efficient 4m³ (141 cfm) onboard compressor and an extra-large 1000 liter (265 gallon) water tank for air-mist flushing allow the DT912D to operate independently from the tunnel or mine infrastructure and guarantee longer drilling period from one set up. This enhances the efficiency of the total cycle time and gives extra flexibility of use. 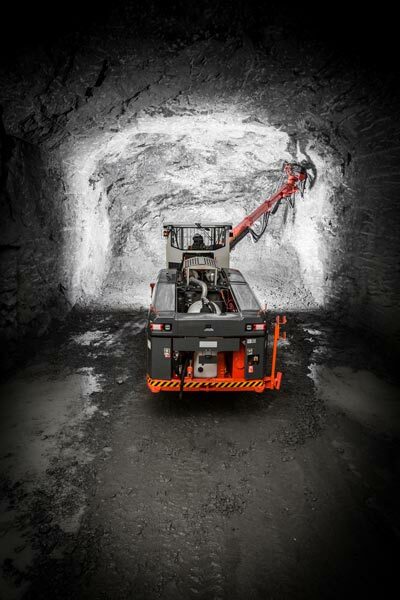 The DT912D offers rapid, safe and balanced tramming thanks to its powerful, 4-wheel-drive center articulated carrier. Also the ITA tunneling awards shortlisted, FOPS/ROPS complied cabin is ergonomically designed and well insulated to minimize noise and vibration; the noise level remaining under 73dB (A) at all times. As an option the cabin is also available with a cabin lifting system allowing even better visibility to tramming and drilling. This all makes the new jumbo an enjoyable workplace for the operator. Furthermore, the well-proven Sandvik Intelligent Control system Architecture (SICA) with comprehensive built-in diagnostics and user-friendly controls ensures ease of use and maintenance. To ensure the best performance, the DT912D offers different instrumentation levels to choose from optimizing its performance in accordance with specific needs. These include the silver package for drilling angles and depth monitoring, while the gold package offers semi-automatic drilling according to drill plan. The platinum package, being the most comprehensive one, has the advantage of automatic boom movements and drilling cycle. 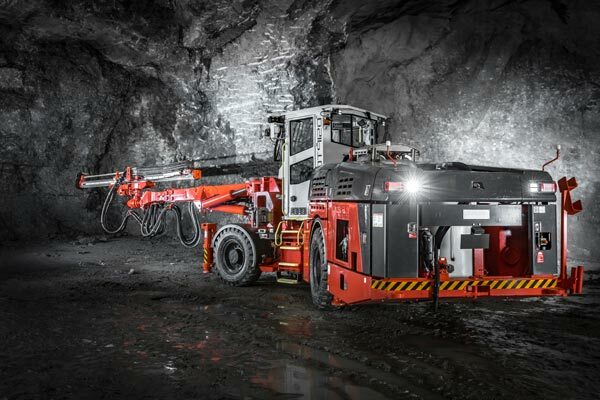 The gold and platinum packages are integrated with the Sandvik iSURE tunnel management tool for accurate drilling, charging and blasting plans. In addition, the iSURE provides useful data collection and analysis reports for improving the work cycle and process and can also be complemented with the new geoSURE rock mass analysis and visualization system.